Protein base (water, pea protein), cane sugar, coconut cream, sunflower oil, natural flavor, sea salt, sunflower lecithin, gellan gum, cashew butter. Clean Protein Smoothies offer 10g of protein and are so delicious it makes eating clean feel like a treat! This product traveled 20 km to reach our warehouse. 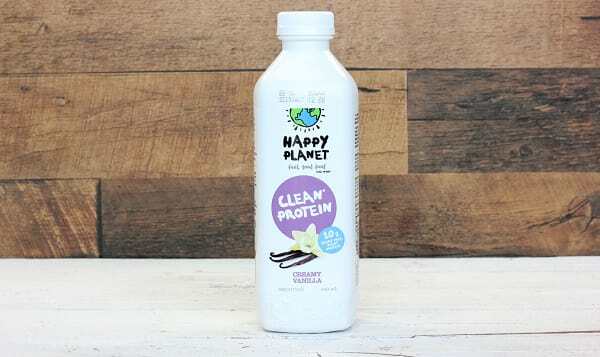 Since 1994, Happy Planet has been committed to a simple mission: produce the most nutritious flavorful, natural juices in the world while supporting sustainable family farming and a healthy environment. Their mission is to cultivate healthy relationships between people and planet. Their support of locally grown organic produce from family farms ensures generations of healthy food and happy creatures, from lady bugs to human beings. This full-circle approach to recycling and energy usage is just one chapter in how they take care of the world's valuable resources. Over 70% of their fruits and vegetables are organically grown, 85% are family farmed and over half of their ingredients are locally grown. Supporting sustainable family farming is Happy Planet's mission. It means their community and their land bases are cared for, and this respects equal generations of healthy food and happy creatures. Happy Planet starts with only hand picked fruits, carefully harvested berries and the freshest vegetables. The fruits and vegetables are kept very cool and then inspected in the washing and grading lines. From there, cold-pressing or hand squeezing (for citrus) are time honored methods of juicing, preventing oxidization and undesirable extracts, like peel oil. All of their smoothies are blended by hand in small batches to ensure exceptional taste. These careful extracting procedures don't happen at big juice companies, where huge quantities are produced for distant markets at the lowest possible cost. They use poor quality ingredients, large-scale machinery, and a pasteurization heat above 160 degrees, which alters the taste and breaks down vitamins and enzymes. Eating quality produce, when processed with attention and precision yields a safe fresh juice, with all of the exquisite taste and potent nutrition intact. This is Happy Planet's purpose.